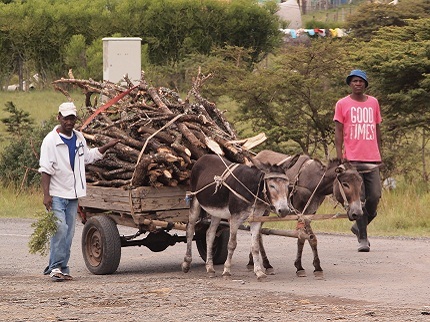 Eastern Cape Province is very different from Western Cape. Western Cape boasts, among other things, the "Mother City," Capetown, plus South Africa's wine industry, plus some of the country's most popular and lucrative resort areas. In other words, Western Cape is a relatively rich province, but Eastern Cape emphatically is not. 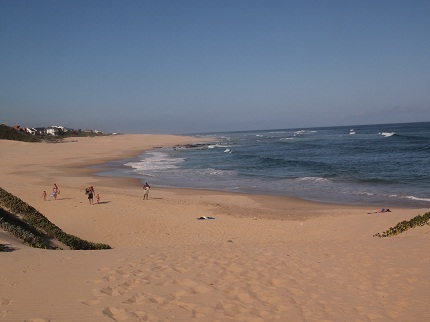 It does, however, have some of the country's most unspoiled beaches, which is one of the reasons we wanted to go there. We left the old folks' home in Alexandria on Monday morning, the 11th, and rode to Boknes-Cannon Rocks, only 25 or 30 miles. We were aiming for a place that we'd heard good things about, and they were true. Cannon Rocks Caravan Park and Resort had grassy campsites for tents or caravans and several other types of accommodation. We wanted a kitchen for cooking so we opted for one of several small apartments that was quite attractive and economical (left). We stayed two nights. When Wally was cycling to the store on our first evening, a car pulled over and the driver, a friendly gentleman with a bushy, white beard, introduced himself (Gordon Gary) and invited us to coffee the next morning. We very much enjoyed our visit with him and his wife Patricia -- a former cycling enthusiast until one of her knees went bad. Cannon Rocks is an all-white, relatively isolated seaside community. Not surprisingly, its residents are concerned about security. While we were there, a meeting was held to discuss formation of a neighborhood watch -- this despite the fact that the community is regularly patrolled by an "armed response" security company. In a related, odd incident, when we first cycled around the Boknes-Cannon Rocks area, checking the stores, we were followed every inch of the way by a security car, lurking behind us with its blinkers flashing. This was for half an hour or so, for several twisty miles. Later, Gordon and Priscilla agreed the guard was probably following us as a courtesy, for our own safety, and perhaps out of boredom. Remarkable. 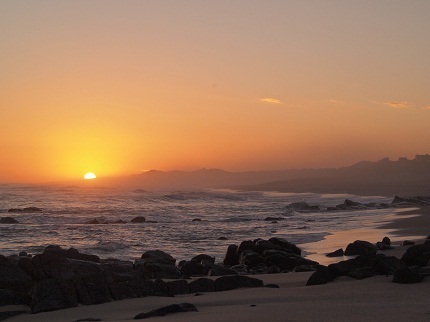 The swimming beach at Cannon Rocks, and a sunset walk. While at Cannon Rocks we enjoyed time in the sun and the water, and also some long walks on the beach. The only negative was the wind -- sometimes fairly pleasant, but often strong enough to kick up the sand. On Wednesday the 13th we cycled just another 30+ miles to Port Alfred. This is described in Lonely Planet as an upscale resort town. We eventually found our way to the book's top recommendation, and for once Lonely Planet got it right. 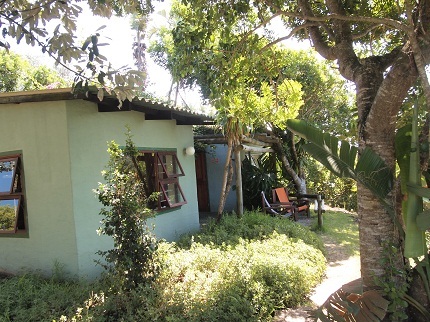 Kelly's Beach House is directly across the street from the best swimming beach in town, and our suite was very attractive, with a living room/kitchen and a bedroom with full bath and its own deck, all for about 450 Rand, no more than US $50! We stayed three nights. We divided our time between swimming, lying around, and walking on the beach. It sounds like paradise, but it wasn't quite, because it was mostly cloudy, sometimes showery, and nearly always windy. But it was still a fine beach and we enjoyed it. We left Port Alfred very early on Saturday morning -- We got up around 4:30 and were cycling well before 6:00 -- because it would have to be our longest ride so far. We were cycling through the old Ciskei, one of the notorious homelands set up during the bad days of Apartheid. We wanted to stay at Kidd's Beach, a good 70 miles away. While we don't recommend 70-mile rides in hilly terrain on heavily loaded recumbents, it was actually an enjoyable day, at least until the last 15 or 20 miles. 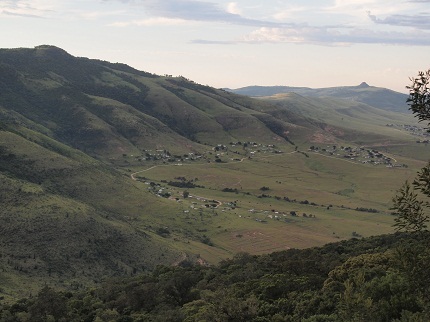 The old Ciskei, now just a part of Eastern Cape province, is inhabited largely by Xhosa people. The region is poor in almost every way except for scenery. It is high, open, countryside with voluptuously rounded hills and mountains, villages scattered here and there, looking picturesque from a distance, less so close up. 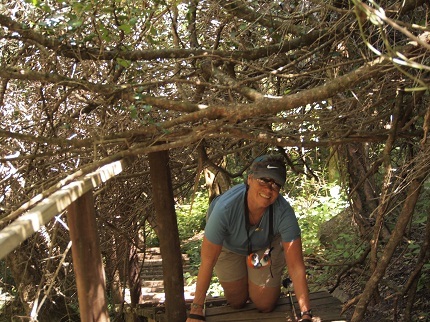 With the possible exception of our time in Addo Elephant National Park, cycling in the old Ciskei, Eastern Cape, was the first time we felt that we were really back in Africa, at least as we remembered Africa from our times in Zimbabwe and Malawi, almost 30 years ago! 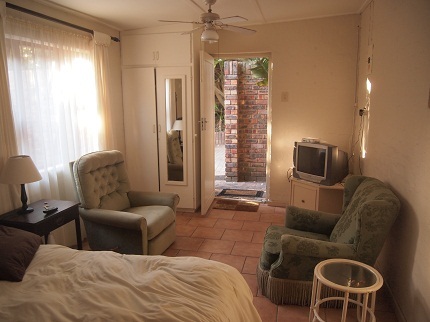 When we arrived in Kidd's beach, we had no place arranged to stay, and the many B and B's looked expensive. However, at the first one we checked, we were asked to come in while the woman made a telephone call. 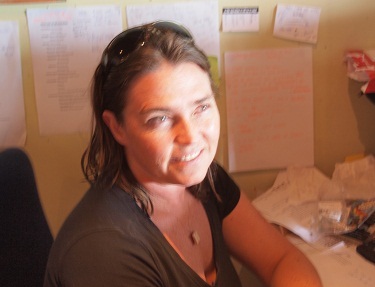 Soon enough, she told us to cycle a few hundred meters down the road to the Breeze Inn where we would be "fixed up." There, the owners Malcolm and Terri showed us a cozy room, helped us make ourselves at home, and told us that they never charge cyclists or long-distance hikers! (A "free will donation" was acceptable, so of course we left one.) Malcolm, a big, friendly bear of a man, doesn't cycle himself, but he obviously loves making the acquaintance of cyclists and other adventurous travelers -- most of them far more adventurous than we are. He has put out the word to other B and B operators in town that if cyclists show up, they should be sent to him! Kidd's Beach is a friendly little community on the ocean. 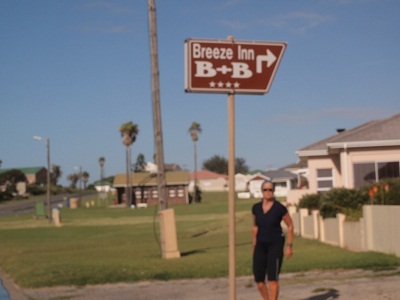 There is a good beach just across the street from Breeze Inn, but we quickly saw where the "Breeze Inn" got its name. It was already too late for swimming, and in the powerful wind, it was getting chilly. Luckily there ia a restaurant on the beach with a reasonably priced menu and a million-dollar view of the sea. 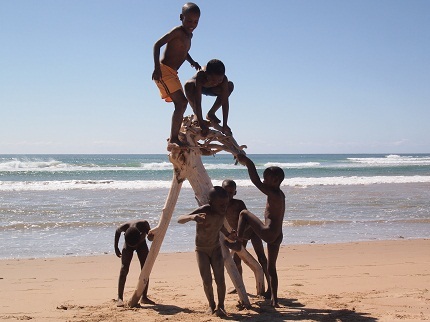 At Kidds Beach we met a friendly, young police constable, a Xhosa. He wanted to try one of our bikes, and did -- for a few feet. He would have been happy to have us photograph him sitting on the bike, but we never thought to do it! The interesting part is that he kept calling Wally "Baas." That's Afrikaans for Boss. This is the New South Africa, but the Old South Africa has not entirely disappeared. These were days on which we spontaneously changed our plans. The original plan: Rride through the city of East London to a beautiful beach called Cintsa; Then return to East London and rent a car for a couple of days to visit a community called Hogsback in the Amathole Mountains -- far out of our way and too difficult to reach by bike; Finally, take a train from East London to the north, and cycle in Mpumalanga Province. But ... As we entered the outskirts of East London, the roads and traffic became increasingly unpleasant. When we saw the airport with all its car rental agencies, we made a quick change of plans. We went to good-old Thrifty Car Rentals. 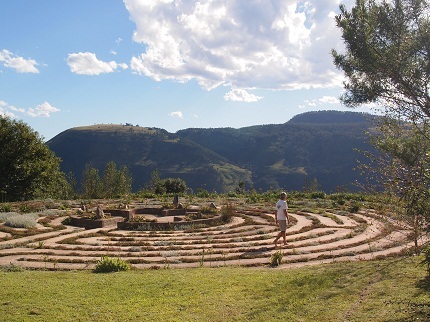 Considering the traffic in the East London area, and the rental rate under $25 per day, we decided to visit both Hogsback and Cintsa by car, returning it when we went back into East London for the train. We would be traveling five days by car rather than bike. What sell-outs! 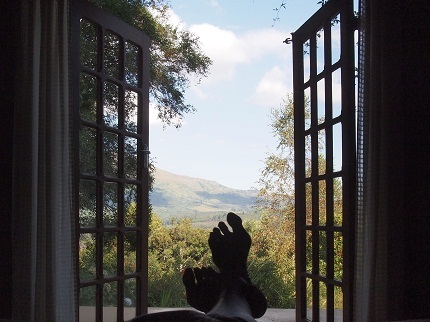 View from our bed, one of Barb's growing collection of "feet pictures"
It took a couple of hours to reach Hogsback by car, longer than we'd expected, but we were not disappointed. 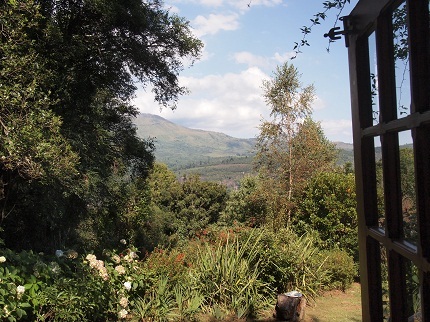 JRR Tolkien was from South Africa, and he spent his boyhood vacations in Hogsback. 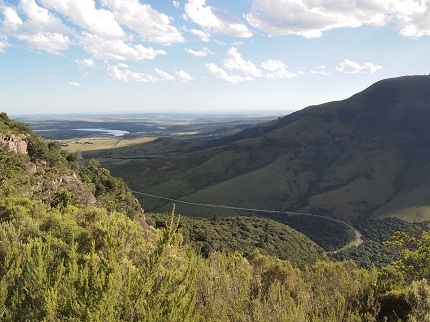 Many people believe that the magical beauty of Hogsback inspired his vision of Middle Earth. At least local tourist operators believe it. We stayed at a delightful backpackers called "Away with the Fairies," and our half of a cottage was called "Frodo's Room." The other half was, of course, "Bilbo's Room." 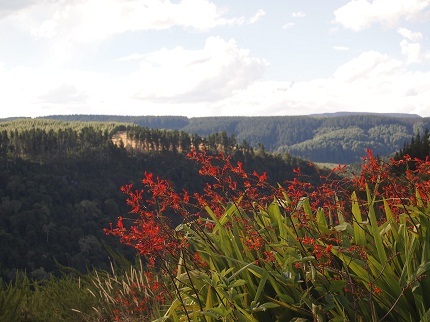 The Hogsback area is made for walking and mountain biking. It is so beautiful that we're adding a portfolio of photos below. 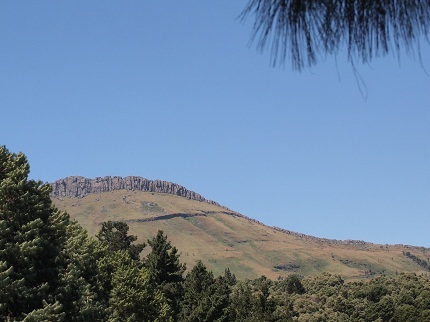 "Hogsback" refers to rock formations that resemble a boar's bristles. 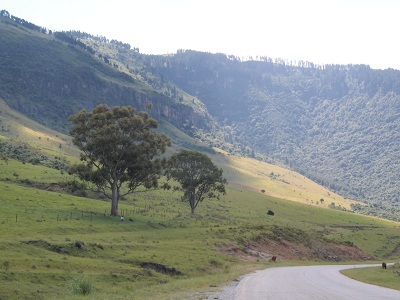 We left Hogsback on Tuesday morning. We also left the perfect, sunny weather behind. 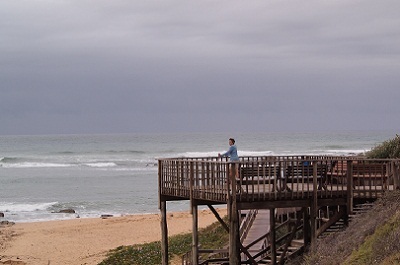 By the time we reached the beach at Cintsa West, (right) it was getting cloudy and windier. The temperature was still pleasant and we went straight to the beach for a while. We didn't get in the water, however, and soon the wind was kicking up too much sand for comfort. On our second day, it was sunny, though still windy. 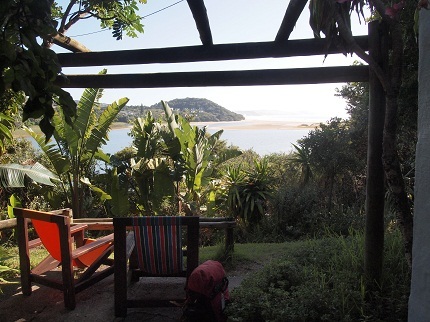 We stayed at an unusual backpackers called Buccaneers. It's almost a resort, though definitely backpacker-style with backpacker prices. It sits above a fine beach and has a small swimming pool with bar and cafe, meals, afternoon games with free wine (which we skip), and evening entertainment (which we also skip). 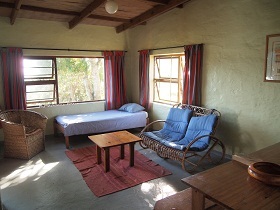 Accommodation ranges from camping and dorms to self-contained cottages. We split the difference, choosing a basic double in a house with a small dorm and two other private rooms like ours. 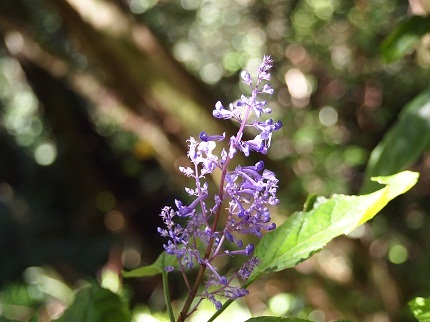 We enjoyed the people in our house: a French woman from La Reunion who now lives in Spain, an older couple -- that is, almost as old as us -- from Cape Town, and a young couple from Australia. 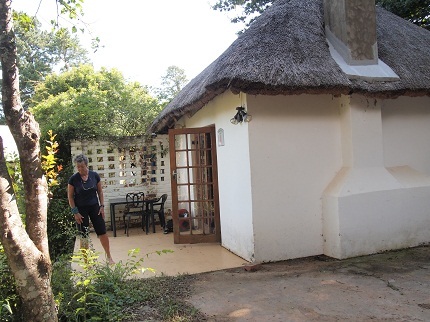 On our second and third nights, we moved down closer to the beach, and "up" in accommodation level, to a two-bedroom cottage that was quieter and more private. The meal we had on our first night was outstanding. It was a candlelight Indian dinner with many dishes, all delicious, and a great dessert. The entertainment after dinner was drumming -- a very good African drummer -- but we didn't stay for it. Instead, we wasted time and money trying to make our train reservations. We enjoyed the other evening meals at Buccaneers, but not quite as much as the Indian feast. Memorable things about Buccaneers: The owner, Sal, (left) spent literally hours trying to help us with the incredibly difficult business of arranging transportation for us and our bikes to Johannesburg. The entire staff, in fact, from the charming women at reception to the ladies who cleaned our room, could not have been more friendly and helpful. Arrangements for ongoing transportation were a worry throughtout our stay at Buccaneers in Cintsa. One morning we drove into East London to buy train tickets. 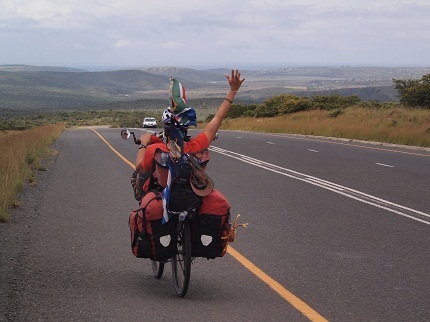 However, even with all Sal's help, it was difficult and expensive to ship the bikes, and we dreaded getting on and off a train -- especially in Jo'burg -- with two bikes and 10 or 11 bags! And then, we'd have to go through all the hassles again to get from Jo'burg to Mpumalanga and Kruger Park. What to do? Finally we decided to rent a one-way bakkie, pick-up truck, for the trip north. That way we could carry our bikes and all our gear, and also get to see parts of the country that we would otherwise have missed. After driving from Cintsa into East London and returning our little red Hyunday on Friday morning, we loaded everything into a truck, which we rented for five days. 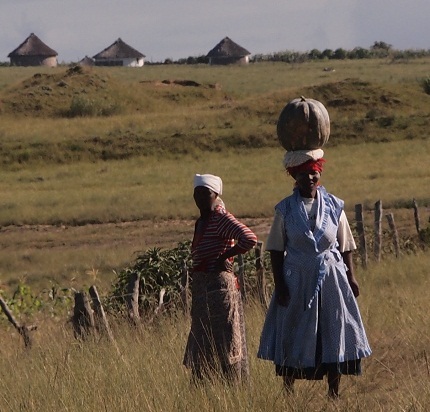 We would be driving first through what used to be called "The Transkei," another so-called independent homeland. We passed the village where Nelson Mandela grew up, but we were disappointed that it was too late in the afternoon and the Nelson Mandela Museum was just closing. 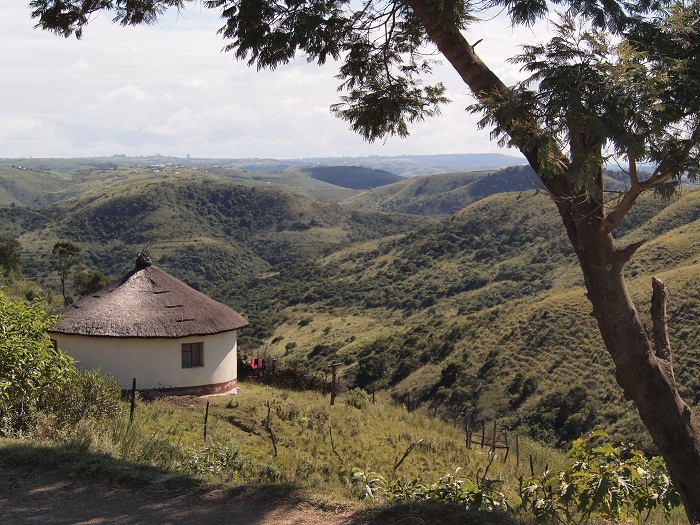 The old Transkei: if people here could eat the scenery, they'd be well fed. 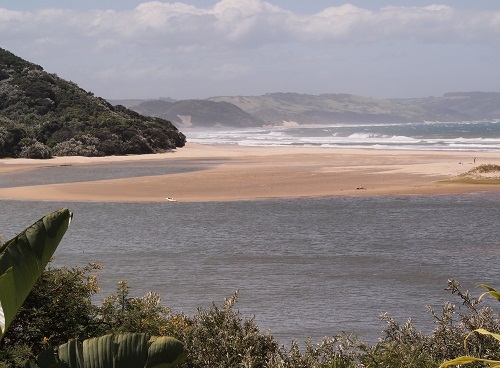 Shortly before Mthatha, the old Transkei capital of Umtata, we turned south to the coast on the road to Coffee Bay, a popular beach resort. 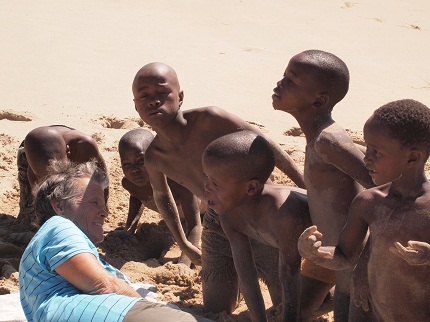 However, we were aiming for a smaller, more remote place on the coast called Bulungula. 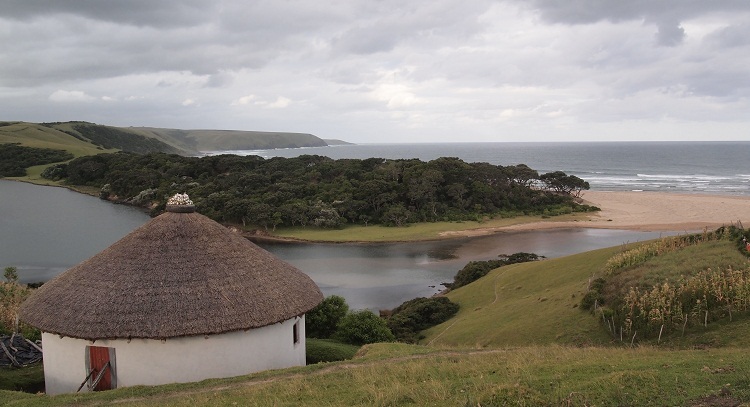 Bulungula has a single backpackers lodge in a small Xhosa village with an extraordinary oceanfront setting. 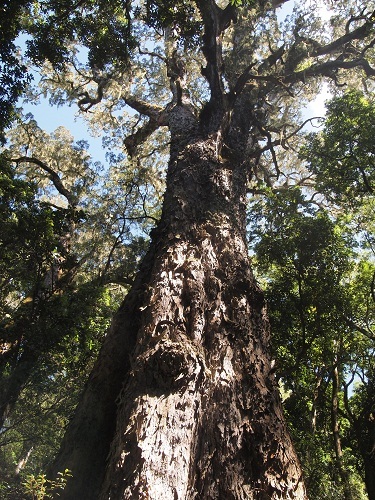 The lodge is partly owned and run by the villagers. 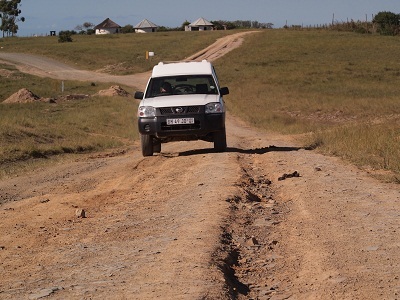 To reach Bulungula, we had to drive on a rough dirt road (right). We thought it would be about 26 kilometers, bad enough at no more than 20 ks per hour. But the road turned out to be more like 46 ks long. 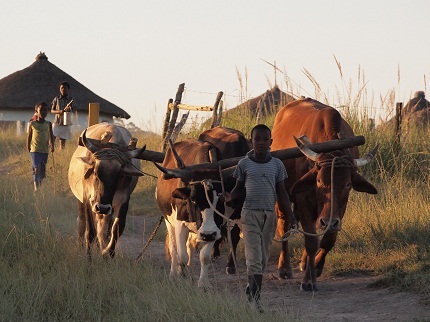 When we finally arrived at the little Bulungula parking area, it was dark and the lodge was still a half-kilometer walk away, through the fields by the ocean. 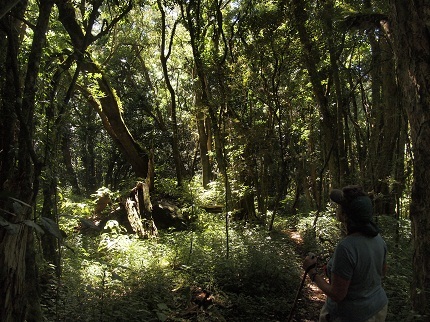 This area has no electric lighting, only solar-powered lights in the lodge buidings themselves. We had to set off on the closest thing to a path that we found in the moonlight. It seemed like we had walked a long distance when we finally saw a few dim lights of the lodge ahead. Bulungula Lodge was worth the difficult trip. An Irish couple whom we had previously met were already there, and they assured us that when we saw the place in daylight, we would not want to leave. They were absolutely right. It was the prettiest beach, with the best swimming, of any place we've been in South Africa. An added bonus was the horde of little boys playing on the beach and in the water who gathered around us and, after a while, clowned for the camera. 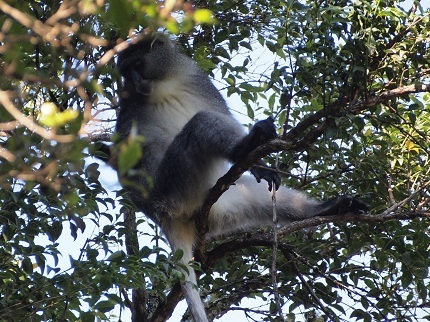 ... and show off for the camera, or just for fun. 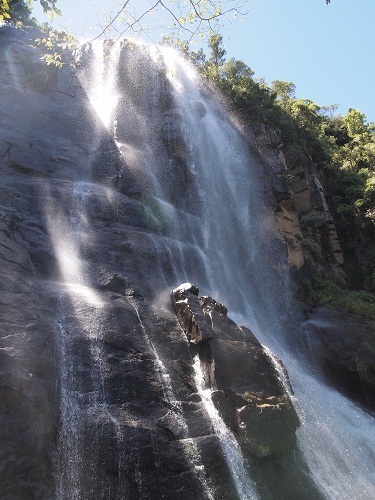 Bulungula was such a beautiful spot that we would have stayed a week if we could. 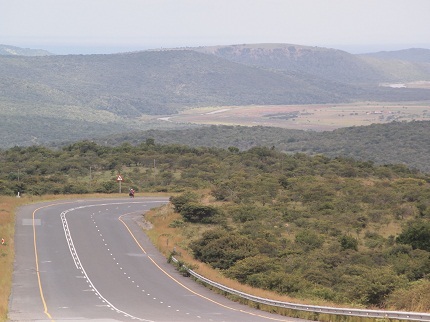 However, we had to move on to the north if we were ever to reach Mpumalanga and Kruger Park. 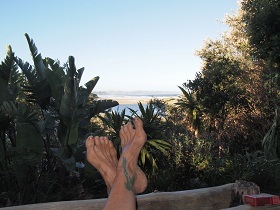 That meant leaving the Transkei and South Africa's beaches behind, probably forever.